Julien Coupet, French situationalist shopkeeper, accused ringleader of “anarcho-autonomous” train saboteurs, and really insufferable pontificator, was finally released yesterday from a Paris jail, on remand. He is still detained, in that he can’t leave the Paris area, and will probably be further harassed by prosecutors. That he’s done nothing illegal will likely mean that he will get to go home soon. His partner (romantic, literary, not “in crime”) was released several months ago without charge, as were the remaining seven in the weeks after their detention. This is likely due to the fact there was absolutely no evidence of them having shorted electrical wires on several train lines. At different ends of the country. During a strike. By rail workers who know how to handle rail infrastructure. But Coupat had set up a commune/corner store in the picturesque Central Massif village of Tarnac, and likely wrote some merciless books about, well, having read bits, its still hard to tell. But they said the state/capitalism/going to work was bad, and the current order was doomed. (DOOOMED!) A premise neither original nor untrue, they did include a fantasy about sabotaging rail lines. Unfortunately, the Minister of the Interior (who’s since been sacked) had some idee fixe about something she’d named “anarcho-autonomous” terrorists. It was a concept she’d invented, but some people thought it might be cool to pretend to be such people, I can only assume, in order to get laid. Then she had random people arrested. A number of Coupat’s supporters remain under arrest for sabotaging things at a protest of his detention, and some for distributing fliers with private details of the “intelligence” official involved. Luckily a coalition of neighbors, activists, even the town’s mayor (a Communist) have been unwavering in their support for the original nine arrestees. The coalition included Jose Bove, who I think is on the right side of every issue, including facial hair. Even the press, after building itself into an foaming frenzy in the days after the rail disruptions, seem to have realized how unlikely to be terrorists these folks are. And it helped that the incidents themselves couldn’t be called terrorism by anyone — outside government — while keeping a straight face and without inserting the term in quotation marks. Julien, shortly before his release, provided an interview to that most bourgeois of papers, Le Monde, in which he generally professed his innocence, as well as talking about Hegel. Then he got two new lawyers, and ten days later was released. 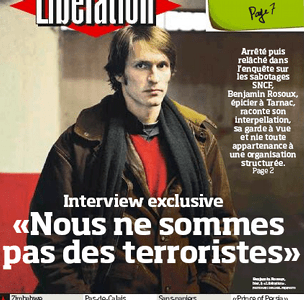 A similar translated postal interview on libcom.org gives the anglophone world a taste of this dangerous terrorist’s concerns. Q. You come from a very well-to-do background, which oriented you in another direction. . .
A. “There are plebes in all classes.” (Hegel). A. Go there, you will understand. If you don’t, no one could explain it to you, I fear. Q. Do you define yourself as an intellectual? A philosopher? A. Philosophy was born like chatty grief from original wisdom. Plato already heard the words of Heraclitus as if they had escaped from a bygone world. In the era of diffused intellectuality, one can’t see what “the intellectual” might make specific, unless it is the expanse of the gap that separates the faculty of thinking from the aptitude for living. Intellectual and philosopher are, in truth, sad titles. But for whom exactly is it necessary to define oneself? 1) Don’t talk crap about sabotaging things. It’s idiotic, especially as the police would rather arrest people who talk crap than investigate things. 2) Never underestimate the desire of those in charge to look like they’re doing something without actually doing any work. If this involves them sending their goons out to bust the heads of intellectuals, so much the better. 3) Show solidarity when people are under arrest, even if they did daft things to get there, but don’t do daft things yourself to make a point. The Clash song about “the British Army waiting out there weighing fifteen hundred tonnes” springs to mind here. 4) Once people like Julien Coupat are released, make fun of them mercilessly, while always remembering that we need a world in which people are free to be pompous blowhards, but not one that gives other pompous blowhards the right to arrest the merely annoying in the name of law, order, and the defense of rich folks. P.S. : You can, of course, visit Julien Coupat’s Facebook page. If he’s a real situationalist, he’ll appreciate you posting Miley Cyrus videos on a much deeper level than you.